Congressman John Lewis pictured with Mayor Keisha Lance Bottoms (middle), Councilmember Andre Dickens (far left), OCA Executive Director Camille Russell Love, and playscape artist Gregor Turk (far right). 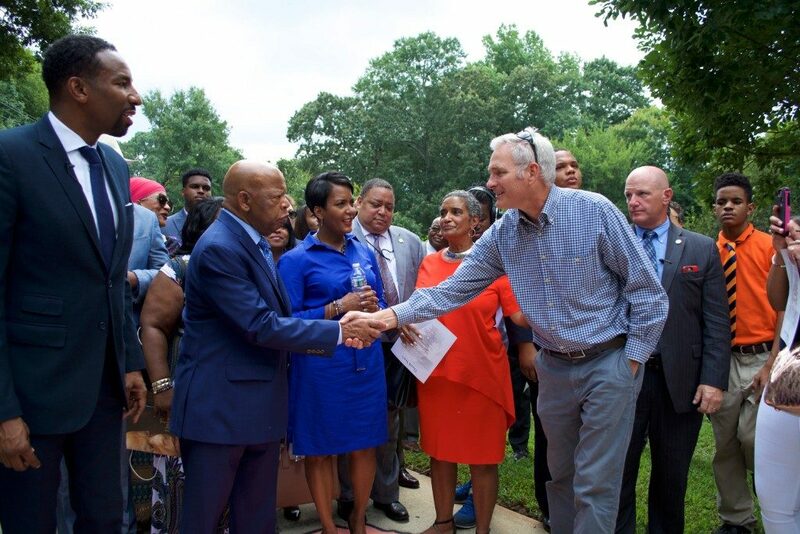 On Wednesday, Aug. 22, a portion of Freedom Parkway was renamed “John Lewis Freedom Parkway” in honor of American civil rights activist U. S. Congressman John Lewis of the Fifth Congressional District. Spearheaded by the John Lewis Task Force, the renaming ceremony occurred at the intersection of Ponce de Leon Avenue and the parkway that now carries Lewis’ name. The celebration featured remarks from Mayor Keisha Lance Bottoms, Congressman John Lewis, and an opening statement from City Councilmember Andre Dickens. Former mayors Bill Campbell and Shirley Franklin were also in attendance. The occasion also revealed two additional projects — led by the Mayor’s Office of Cultural Affairs (OCA) — the restoration of “The Bridge”, a sculpture by Thornton Dial, and the installation of “Ride to Freedom”, a playscape by Gregor Turk. “The Bridge,” an assemblage constructed of multiple found objects, creates an abstract interpretation of the Edmund Pettus Bridge. The artwork, originally dedicated to Congressman Lewis in 2005, also symbolizes his lifelong quest for the advancement of civil and human rights. Funded through KaBOOM!, a national nonprofit organization that helps provide safe places for children to play, the “Ride to Freedom” playscape tells the story of the 1961 Freedom Rides, where John Lewis and fellow activists traveled from Washington, D.C., through the south, to New Orleans, Louisiana to protest racial inequality. Resting along the PATH Trail, the playscape leads children and adults alike to the John Lewis Plaza. Be sure to visit the new John Lewis Freedom Parkway and the Journey to Freedom Playscape next time you are in Freedom Park!